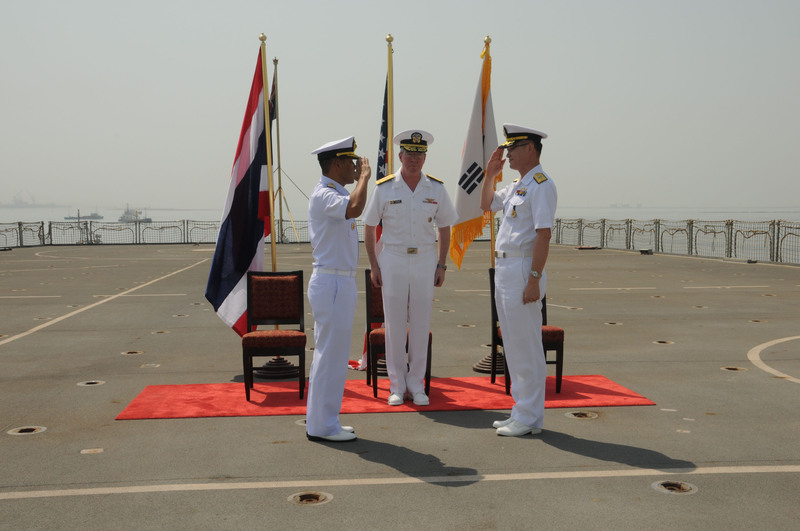 Rear Adm. (Lower Half) Anho Chung, Republic of Korea Navy, relieved Rear Adm. Tanin Likitawong, Royal Thai Navy, as commander, Combined Task Force (CTF) 151 (counter-piracy) during a change of command ceremony aboard British Royal Fleet Auxiliary Fort Victoria at Mina Salman Pier, Bahrain, June 18. Republic of Korea Navy Rear Adm. Anho Chung, commander, Combined Task Force (CTF) 151, right, shakes hands with Republic of Korea Navy Rear Adm. Anho Chung while Vice Adm. John. Miller, commander, U.S. Naval Forces Central Command/Fifth Fleet/Combined Maritime Forces, center, observes, during change of command ceremony aboard Royal Fleet Auxiliary (RFA) Fort Victoria (A387). 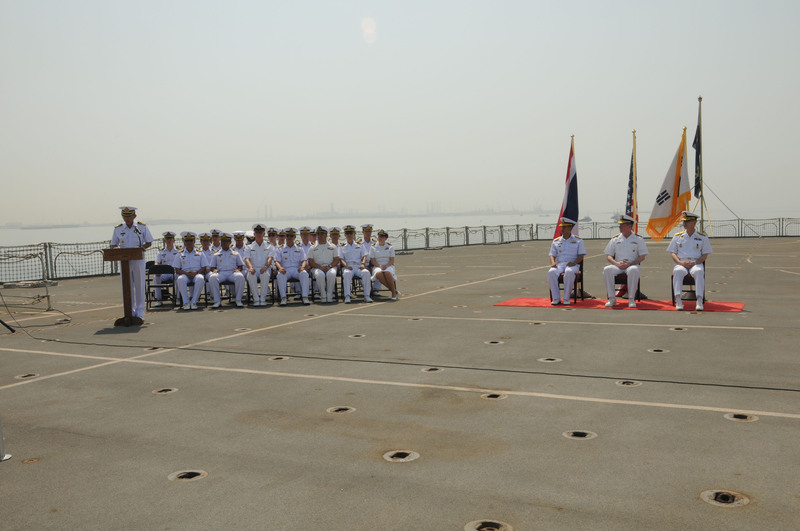 The ceremony concluded the Royal Thai Navy’s first command of CTF 151, which consisted of a multi-national staff embarked aboard Fort Victoria. Members from the Combined Task Force (CTF) 151 staff listen to a speech during a change of command ceremony aboard Royal Fleet Auxiliary (RFA) Fort Victoria (A387). The Royal Thai Navy has had considerable counter-piracy experience in the region over the last two years. They previously deployed ships to Combined Maritime Forces (CMF) counter-piracy mission, with a further deployment scheduled for later in 2012. This was confirmed by the Thai Prime Minister, Ms Shinawatra, who expressed her continued commitment to CMF when she visited the headquarters in May for an update on current operations and the Royal Thai Navy contribution. The three month operation further strengthened ties with other counter-piracy naval forces and operations in the region, as well as developed communication and collaboration within the merchant shipping community. By focusing on international cooperation and coordination, response times to incidents have been reduced. Litikawong welcomed Rear Adm (Lower Half) Anho Chung saying that he has the right talent, mindset and leadership to continue the mission. CTF 151 is one of three task forces under control of Combined Maritime Forces (CMF), based in Bahrain. CTF 151 was established in 2009 to deter, disrupt and suppress piracy, protect maritime vessels of any nationality and secure freedom of navigation for the benefit of all. CTF 151’s area of operation encompasses 1.1 million square miles in the Gulf of Aden and Somali Basin.